Today marks six months since my Dad died. 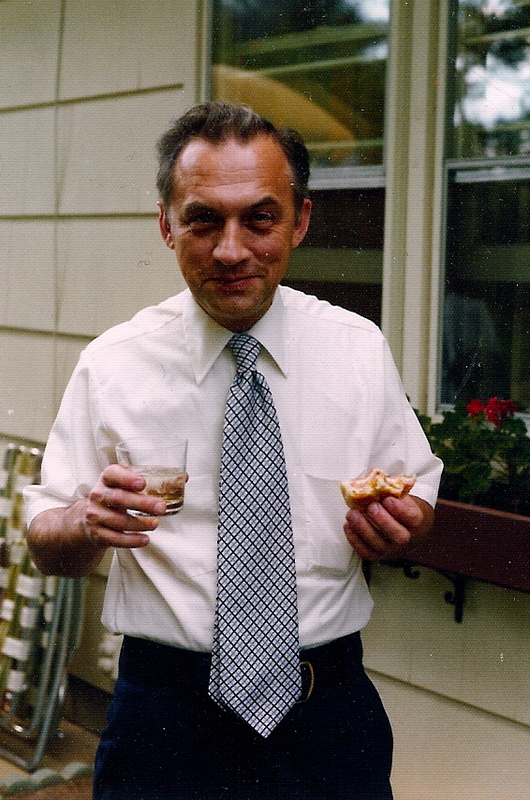 This is one of my favorite photos of him: standing on the patio in our backyard during a party, sandwich in one hand, scotch in the other, supremely happy. The idea that six months have passed is both hopeful and daunting to me. Never have I been more amazed at the way time expands and contracts, accelerates at break neck speed and then stops entirely. The experience of grief is something I constantly remind myself not to fight against. When in doubt, I try to breathe and surround myself with friends. My Mom and Dad both trained me to “look up” the things I didn’t understand. So, like Joan Didion, I often turn to books for research, for solace. I have read Didion. I have read Auden. I have read Lamott. I have read Dillard. They all help. My Mom spent the holidays with me, our first without Dad. They were strange days, one of us trying to “out-happy” the other one day, talking at length about the man I called Dad and she called husband over oysters and beer on others. During the first weeks after Dad died, I thought I might have lost my ability to write…or perhaps my reason. The first words I “had” to write for a work project following his funeral felt wrong and sounded hollow to me. The client was happy, though, and I realized that it might be a long time before anything felt right or sounded good to me. I agree with Joan Didion that grief is nothing like what you hear. Nothing like we expect. The better news is that my moments of joy are also nothing like what I’d expected. This morning, I flew back to Charleston from an incredible weekend away. As the plane took off, I looked at the glittering lights, a sight I always love. It occurred to me that if my Dad is truly in me and all around me, he was seeing it, too. And while I still carry the ache of missing him, I am happy knowing that perhaps my Dad and I share something larger: vision. And I can carry him with me wherever I choose to go. you are amazing. i am so glad you are my friend. Hang in there Jenny. Finding wisdom in difficult loses or experiences seems to help me. My dad’s death (almost 10 years ago), my crazy mother, my oh too near death experience when Bayard was born and the subsequent death of my fertility, our house fire and flood in 2009… each of them takes my breath away sometimes, and then I find a nugget of wisdom that helps me move on to the next moment. Here’s to more bright spots than dark ones in 2010! i love how you write. and think and feel. but if it you didn’t write a thing, this picture of your dad tells so many stories!